About 10.5 million years ago the “Urrhein” ran from Worms to Bingen right across our today’s Rhinehessia. From early on teeth and bones were found when the local people mined sand for construction. 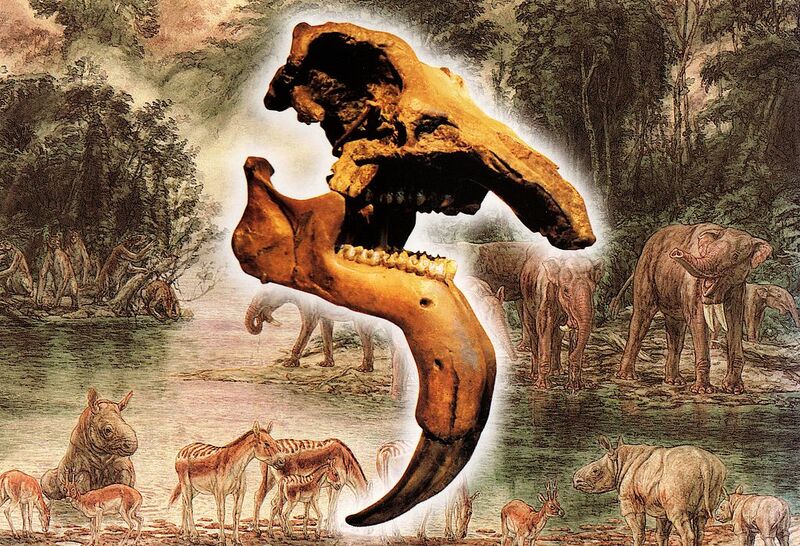 The findings in the “Dinotherium sands” made Eppelsheim famous all over the scientific world. Many fossil species of mammals were found here first and described. In 1820 the famous thighbone of a great ape was discovered, known as “Eppelsheim Femur”. It was in fact the first finding of a fossil ape worldwide. In 1835 a world sensation happened! In the field of “Jörgenbauer” Johann Kaup and August von Klipstein recovered the complete upper skull of a Dinotherium giganteum (beast), a distant relative of the elephant with a height of 3.5 m. Its tusks are bent downwards and are located in the lower jaw. They apparently served to peel the bark of a tree. Of the then five known species of proboscidea (animals with a trunk) there exist only two related species worldwide today, in Southeast Asia and Africa. Findings of teeth of another genus of great apes prove the existence of upper primates in our region, which were named "Rhenopithecus eppelsheimensis" after their archaeological site. There are four species of bear dogs (predators); one of them carries our name throughout the world: Amphicyon eppelsheimensis. The existence of rhinoceros, eohippus (the earliest horse) and sabre-toothed tiger was also proved. The Natural History Museum Basle represented by Dr. Burkart Engesser donated to the community of Eppelsheim a replica of this skull for the Dinotherium Museum on its opening day in August 2001. It is the centre of the exhibition and together with other exhibits selected byDr. Jens Lorenz Franzen from the research institute of the Senckenberg Museum in Frankfurt bears witness to the Eppelsheim archaeological excavations. The museum goes back to the idea and initiative of the former mayor and honorary citizen Heinrich Roos. Concept and texts come from Dr. Jens Franzen. The project was financed by the community of Eppelsheim, lots of donations and last but not least through the commitment of volunteers.